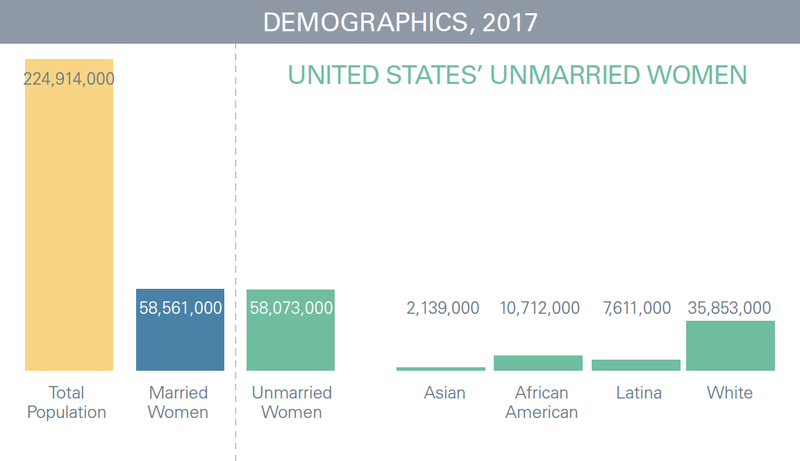 The Voter Participation Center today released a groundbreaking new report: “Unmarried Women in America: Cornerstone of our Democracy.” The report includes previously unreleased research on unmarried women in key battleground states, including data on demographics, voting and registration rates, age, economic impact, health care, educational attainment, and more. VPC pioneered the concept of a “marriage gap” among women voters, recognizing that whether a woman is either married or unmarried is one of the most powerful predictors of differences in civic participation and voting behavior. Since VPC’s founding in 2003, it has registered nearly four million people — including nearly one million unmarried women since 2012. Read “Unmarried Women in America: Cornerstone of our Democracy” here. There are more than 58 million unmarried women in the United States – half of all women and 26 percent of all adults. Single women are one of the fastest growing demographic groups in the country. Not all “women voters” are the same. Unmarried women are living drastically different lives than married women in this country. 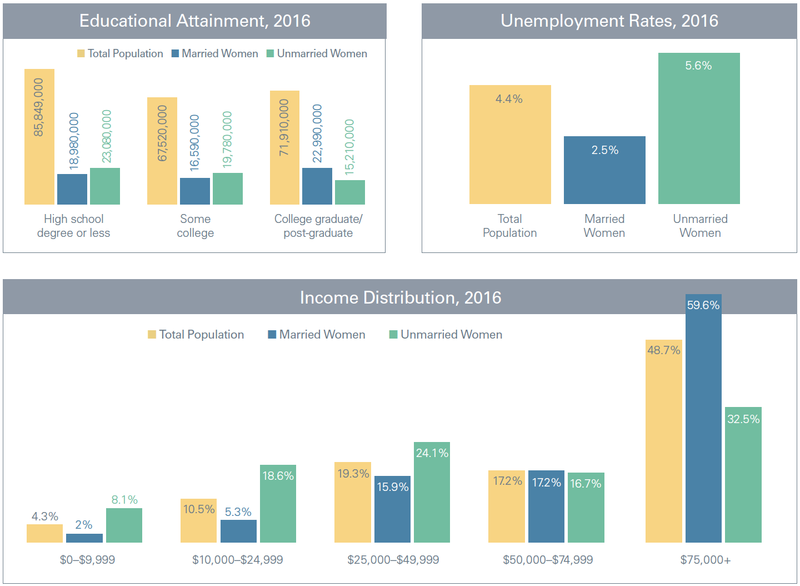 Unmarried women make less money, are more likely to live in poverty, less likely to invest in the stock market, have higher unemployment rates, less savings, fewer have health insurance, and little, if any, dependable retirement income. However, unmarried women are also one of the largest segments of the economy, whether as first-time home buyers, the sole household decision maker, or the chief breadwinner.Unmarried women—whether as graduates struggling to pay off student loans, upper-income professionals, first-time homeowners, or minimum wage workers holding down two jobs just to survive—are one of the most disproportionately groups impacted by the policies of the Trump Administration and Republican-controlled Congress. While married and unmarried women were both about 26 percent of the voting eligible population in 2016, married women were more likely to be registered and more likely to vote. In fact, one in 10 unmarried women who were registered in 2016 didn’t vote. If unmarried women are going to hold politicians accountable and force Congress to work on improving things for them and their families, they need to register and vote for candidates who speak to their issues.